Once both boys were in bed I did what every parent does with a little bit of freedom ... I went downstairs, took out the ice cream from the freezer, and served myself a heaping bowl of Talenti gelato. Yum. Actually before that I took the dog outside to do her nightly business and checked the mailbox. Even though the Elizabeth 8k Road Race was weeks ago, I was reminded of the event when I saw that the race organizer (or someone associated with the race) had mailed me my medal! 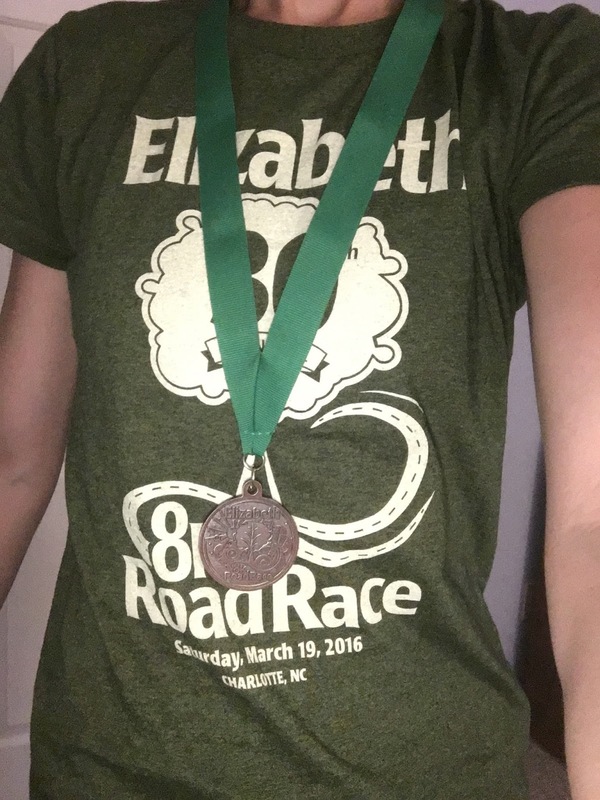 It was a total coincidence that I was actually wearing the race shirt today. It's really comfortable and fits well for a typical race shirt. Anyways I'm so glad that they took the extra time and energy to mail me my medal ... I MAY have asked them once (or five times) about picking it up myself but I suppose the person thought I was too crazy and didn't want me near their home. Joking. Maybe. Either way I have it and can't wait to show Mason the medal tomorrow morning since he asks me after each race if "I won" ... yeah kid this time I (kind of) did.